story by Liz Pacheco | photo byChristopher LeamanTo describe the warehouse for the future Philadelphia Sculpture Gym as rough would be an understatement. As of March, the 7,500-square-foot, brick-walled space was dark and dingy. There was a long, beat-up wooden table left from the previous owners, and piles of cleared wood and metal were gathered on the concrete floor. But Darla Jackson and Justin Grant, founders of the Sculpture Gym, weren’t discouraged by the space; they were inspired. They gleefully give a tour of the warehouse, pointing out the areas designated for woodworking, metalworking, moldmaking and casting, as well as the future locations for the gallery space and members lounge. “Some of the spaces we looked at, oh my god, needed everything,” says Jackson. “And this space, it needs a lot, but…” she trails off, “…well this has a roof already,” finishes Grant. The married couple signed a lease for the warehouse in October and scheduled their first event, a Charter Member Exhibition Opening, for May 19. In the meantime, they’re hard at work, transforming the space into a haven for sculpture professionals, amateurs and everyone in between. The Sculpture Gym is the latest in a new entrepreneurial business trend happening in Philadelphia. These “gyms,” or co-working spaces, are providing the space, tools and often the materials for developing hobbies and honing hands-on skills in a community setting. In University City, NextFab Studio, a high-tech workshop, describes itself as a “gym for innovators.” Opened in January 2010, the space has been so successful that founder Evan Malone has decided to open a second, flagship location in South Philadelphia this summer. In Manayunk, Michael Vogel, an architecture student turned businessman, launched Philadelphia Woodworks in March, offering the antithesis to the dusty, solitary spaces often associated with wood workshops. Membership is based on the same model at all three places. Individuals purchase a membership and, just like at a fitness gym, gain access to equipment, working space, professional guidance, classes and community spaces. Unsurprisingly, these businesses have become popular gathering places as bastions of creativity, learning and community collaboration. 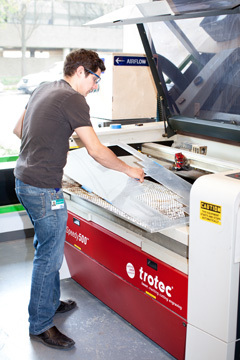 Located inside the University City Science Center, NextFab Studio is geared toward the high-tech hobbyist. The 4,400-square-foot space is filled with 3D printers, computer-controlled machines, electronic workstations, hand tools and countless other technologies. For anyone looking to build a prototype, use a laser cutter or make unique art, this is the place to be. NextFabStudio | www.nextfabstudio.com | 3711 Market Street | 215.921.3649 | The "gym for innovators" offers a range of tools including 3D printers, metal working machines, laser cutters and other tools for the high-tech hobbyist | Coming Summer 2012: NextFab 2, 2025 Washington AveThe idea for NextFab started with Malone’s Ph.D. research at Cornell University on the 3D printing of complete functional devices. “Meaning not just printing a plastic doodad, but actually printing batteries, circuits, living tissues, food and all sorts of things, more useful objects, straight out of a single 3D printer that’s printing a variety of materials,” he explains. Malone’s research lead him to develop Fab@Home—a project that took his lab technology and made a simple, less expensive version for people at home. At the same time Fab Labs, nonprofit labs providing access to tools and technological training for modern inventing, were gaining popularity. Inspired, Malone decided to open his own version of a Fab Lab. The most important difference between a Fab Lab and NextFab Studio is that Malone’s business is for-profit. “The thought was let’s pay for this mission of providing access to technology and helping people get into turning their ideas into products and starting businesses around them,” says Malone. “And pay for it by offering services.” These services are in the form of contract work done by the staff. This contract work varies in scope and size—the most memorable project being a simulated lumberjack logroll competition for Dos Equis beer. Even on weekday afternoons, the place is busy. Bob Sponsler, an operating room nurse at Jefferson University Hospital, is working on one of his 75 unfinished projects. He found NextFab after his ambitions became too much for his at-home 3D printer. Sponsler invented a system for organizing surgical instruments on a tray, and instead of sending out to have prototypes made found he could create them himself at NextFab. As Sponsler explains his work, Malone is across the table having a meeting. The computers next to the table are being used, and staff and members filter in and out. The space, which also doubles as a classroom, is obviously being stretched to its limits. Although 4,400 square feet is a significant amount of space, increasing membership and contract work means NextFab needs to expand. The 21,000-square-foot space in South Philadelphia set to open this summer will meet that need. The space will have, among other features, 24/7 private studios, classrooms, a chemistry lab, cafe and exhibition space. The current location in University City will continue to operate as well. Philadelphia Woodworks | www.philadelphiawoodworks.com | 4901 Umbria St | 267.331.5880 | All the benefits of your grandfather's wood shop plus high ceilings, lots of natural light and a welcoming woodworking community“This is not your grandfather’s workspace,” says business manager Emily Duncan, as she gives a tour of Philadelphia Woodworks. At 8,000 square feet with 17-foot-high ceilings, it’s an impressive space. The building feels open and airy. Large windows on three sides of the workshop allow natural light to fill the room. Above the 5,600-square-foot shop sits a mezzanine with lockers, a small library and additional storage space. There’s a kitchen, art and furniture gallery, and even a lumberyard. Much of the wood furniture, benches and tables in the members lounge and workshop were made by staff. “Everything that’s here, other than the brick walls or the slab floor, we built by hand,” says Vogel. Vogel’s affinity for building started at a young age. “Growing up I loved building stuff, I loved tinkering. I always wanted to be an architect,” he says. “I went to college for architecture and getting into the woodshop was the most fun thing for all of undergrad…I loved what I was building and I actually cared more about the wooden models of what I was doing than the actual projects themselves.” Realizing he wasn’t ready to be an architect, Vogel chose a different path: finance. But during the next 10 years, Vogel found himself wanting to get back in the woodshop. “I always knew woodworking would be for me that fun escape, if there were a place that existed that I could do it,” he says. Eventually, Vogel decided to take matters into his own hands. He printed postcards advertising the idea for Philadelphia Woodworks and started distributing them in public places. The mailing list quickly grew to a few hundred. Encouraged by the support and the success of other member-driven woodworking shops already established around the country, Vogel quit his job, found the space in Manayunk, and started putting together staff and membership. Although the space has only been open a couple months, membership has grown rapidly. “The people that are in here are from all ends of the spectrum,” says Duncan. “We have men, women, young, old, middle [aged], experienced, no experience, all kinds of people in here.” Again, collaboration has been vital. Duncan talks about a knowledgeable member who, when helped by the shop manager, produced a corner cabinet that exceeded anything he’d done before. She also talks about a woman who had never been in a shop before, and is learning about the techniques and tools to make a birdhouse. Just like NextFab and Philadelphia Woodworks, the Sculpture Gym is intended for all skill levels. Although Jackson and Grant both hold art degrees (from Moore College of Art and Pennsylvania Academy of the Fine Arts, respectively) they stress that their space isn’t intended solely for artists. “We want…everybody [to] have access to this stuff,” says Jackson. “So not just the sculptors, not just artists, crafts people, [but] people who just want to try it out and see if they even like it.” And with a gym membership format, people can try welding, woodworking or ceramic work, with little time or money invested. Philadelphia Sculpture Gym | www.philadelphiasculpturegym.com | 1834 E. Frankford Ave | philadelphiasculpturegym@gmail.com | Slated for opening in mid-May, the gym will have areas for woodworking, metalworking, moldmaking and casting, plus a gallery for displaying member workFor Jackson and Grant, the idea for a “gym” came from their basic needs as artists. “It starts with us being sculptors that accumulate mass quantities of everything,” says Jackson. “So we have lots of tools that we just keep buying over the years.” Some tools are used everyday, some once a month and some even less. When they moved into a row house with their young daughter, they quickly realized that without regular studio space making art was going to be a challenge. “We had the table saw in the kitchen for a year,” says Grant. “I’m doing plasterwork in our second floor bathtub,” says Jackson. While both sculptors have had studio space in the past, whether through school, work or a commission, they knew they needed a more permanent home. “Justin and I were talking about opening a space where people could use our things,” says Jackson. They didn’t think much about the idea until Jackson was encouraged to apply for a Knight Arts Challenge grant in 2011. Going up against some major arts organizations in Philadelphia, Jackson was happily surprised when she received a $20,000 grant toward the project. From there, they launched a Kickstarter campaign and began working on the warehouse in Fishtown. In the time before the space opens, Jackson and Grant have built a dedicated member and volunteer community, hosting regular potlucks and work days. They already have a number of charter members, whose work will be displayed at the show on May 19. The community aspect is really important to Jackson and Grant. As artists, they often find their work can be solitary and although they have each other, an outside perspective is often welcome. “There’s nothing like a den of activity to get you inspired without being competitive,” says Grant. While no one is quite satisfied with the “gym” terminology, it’s become the most concise way to describe how these spaces function. But there’s a larger focus on teaching, learning and sharing than at any fitness gym. “I think community here is more important than the machines,” says Vogel. All the founders agree that their spaces are truly member-dependent. Although the gyms are based on the passions of one or two individuals, the members are critical contributors to how the spaces will develop.